The wi4 Fixed Point-to-Multipoint Canopy solution is streamlined, powerful and simple, with built-in installation and deployment assistance, making Canopy solutions faster and easier to implement. Motorola's Canopy Point-to-Multipoint solutions are leading the way with successful deployments all around the globe. 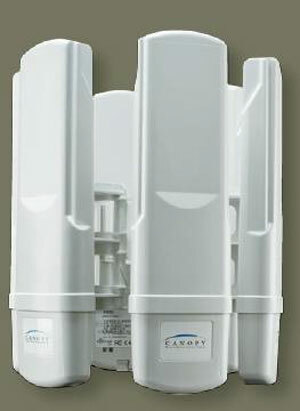 Canopy solutions deliver scalable, interference-resistant, high-speed connectivity to multiple residential, business, institutional and municipal locations. The platform combines exceptional reliability with robust performance, scalability, multiple layers of security, ease-of-use, accelerated deployment and remarkable affordability. It also integrates seamlessly with existing network systems and management tools, making it easier and cost efficient to extend existing networks. Maximizing the productivity of unlicensed wireless frequencies, Canopy solutions streamline the development, deployment, enhancement and extension of advanced IP-based wireless broadband networks. They excel at delivering ubiquitous high-speed connectivity and state-of-the-art services, and are currently helping drive successful business models as well as helping bridge the digital divide in more than 120 countries worldwide.